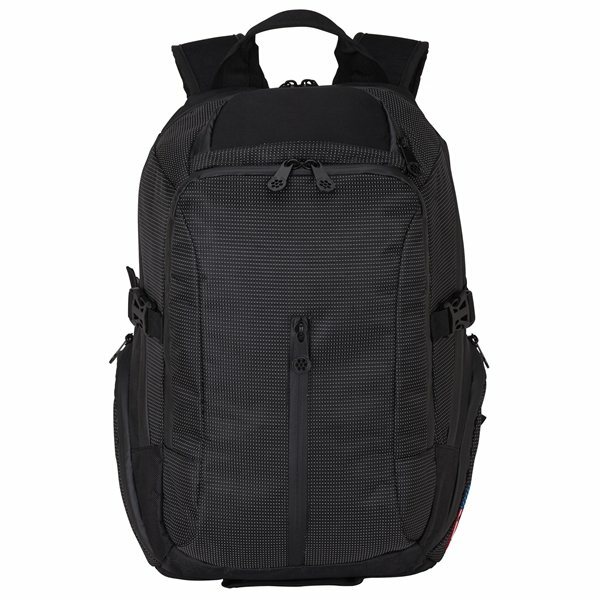 The fully-lined Work-Pro II Backpack is made with heavy-duty 1680D, rip stop and 210D lining. It features a padded 15.6" laptop compartment, a convenient top zippered EVA compartment for smartphone and valuables, a zippered compartment with organizer and zippered mesh pouch, and a vertical zippered pocket for essentials. The zippered front compartment has multiple pockets and is a great place to store your accessories. It also includes two zippered side pockets as well as a carry handle, padded air mesh back and adjustable backpack straps, and a chest strap. A buckle system on either side of the bag helps keep its footprint slim and portable.